The Montreal Canadiens continue to roll and they’re off to another brilliant start, going 8-0-1 after knocking off the Toronto Maple Leafs on Saturday night. Toronto has been in tough against Montreal, having lost 10 straight to their rivals. The Habs got goals from Alex Galchenyuk and Shea Weber, who scored the 2-1 winner on a four-on-three power play and put the Maple Leafs away. The goal was Weber’s fourth of the season, marking the third time in nine games he’s come up with a power play marker. The 31-year-old has 10 points in nine games and is proving many of his uninformed critics wrong, both on an off the ice. He put in more than 26:46 of ice time over 28 shifts on Saturday night and managed a monstrous six shots on goal. 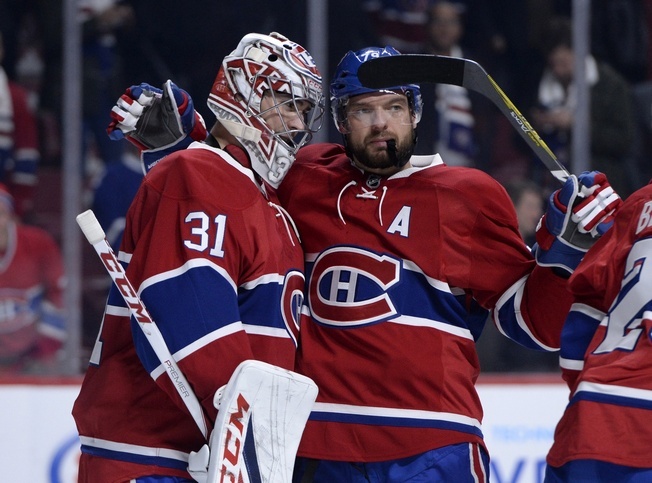 Goalie Carey Price improved to 5-0-0 on the year after missing a handful of games due to injury. He boasts a 1.40 goals against average and a .954 save percentage, proving that he’s still one of the best in the game. On Saturday, the 29-year-old faced 38 Toronto shots and turned aside all but one. Maple Leaf Nazem Kadri was able to score early in the third period, notching his third goal of the season. Montreal has built on strong goaltending and the sturdy play of Weber to go undefeated thus far, but other players have been making a difference. Alexander Radulov looks like a man reborn. He has seven points in nine games and posted two helpers on Saturday. Many, including yours truly, were sceptical of the Russian’s arrival in Montreal and for good reason. But Radulov has proven a model player so far, as he illustrated on October 24 against the Philadelphia Flyers when he posted three points and seemed to be everywhere on the ice at once. Obviously the Habs hope the good times keep on rolling, but the losses will eventually come and that will put this team to the test. How they’ll handle adversity will say a lot about Montreal’s future fortunes, as last season’s run without Price proved. But for the time being, this club is a lot of fun to watch.